On Friday night around 4:30pm I got the email I’d waited almost 3 weeks to hopefully receive. After a few letters of request sent in to different extended members of the Leeds United management staff, I was notified that my request of an observational visit had been approved by Marcelo Bielsa. As you would imagine, Bielsa, wherever he has been in recent times, receives thousands of requests each season to observe his unique coaching style, and I was told quite clearly in response to my initial request that - “Christmas period, you’re lucky to get in for anything”.. After months of debating whether It was even worth trying to go observe the methodical madness Bielsa is known for, I left Leeds United’s Thorp Arch Training Ground on Saturday evening with an overwhelming sense of fulfillment in what I had witnessed. After checking-in to reception around 10:00, I was given a visitor pass from security and escorted out to the fields. Sessions were set to begin around 10:30. 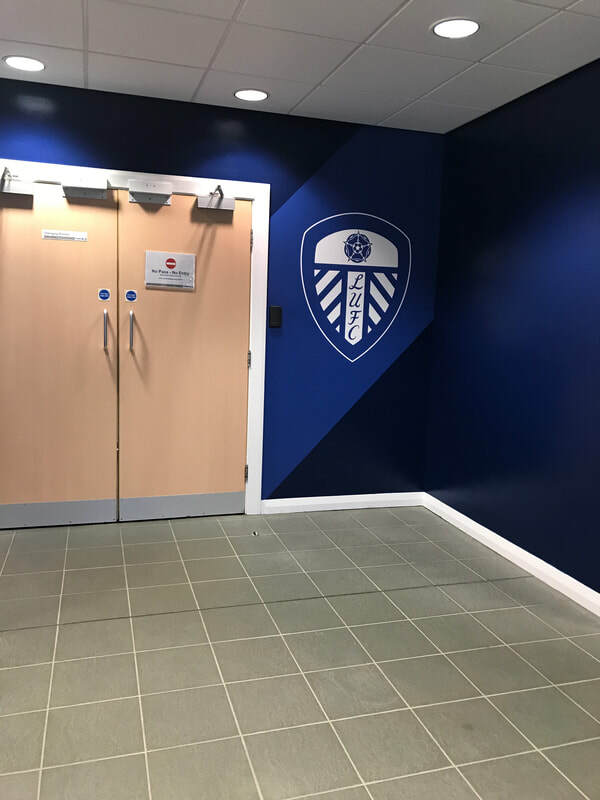 Leeds were set to face QPR on Sunday at 2pm in the FA Cup, so in all honestly I came into the visit not exactly too sure of what I was about to experience. I naturally expected something resembling a generic pre-game preparatory session, fine-tuning a few details before tomorrows game. But as we reached the fields, I already knew this was going to be something a little out of the ordinary. This is a Bielsa team after all. Once we got down to the fields, 5 fields were prepped and ready to be put to use, each one sprinkled with mannequins, and each one created for a different purpose and area of the pitch. 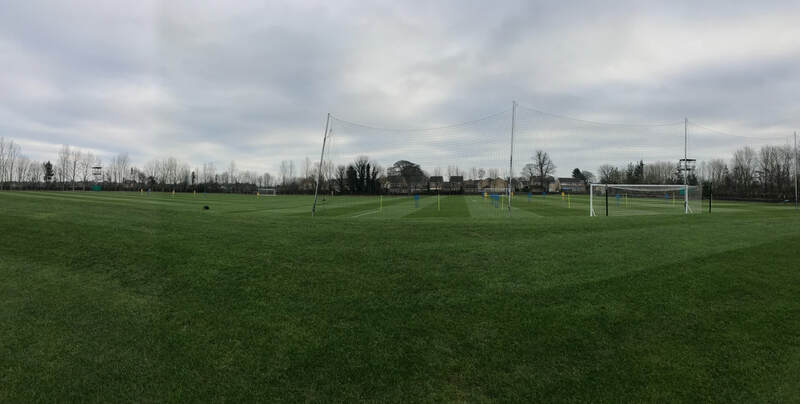 As the players headed out to the field, the make-up of the squad consisted of around 13 first-team players, 8 u23 players, and 5 u18 players, with some players coming back from injury on another small field for a total of around 29 players training that day. 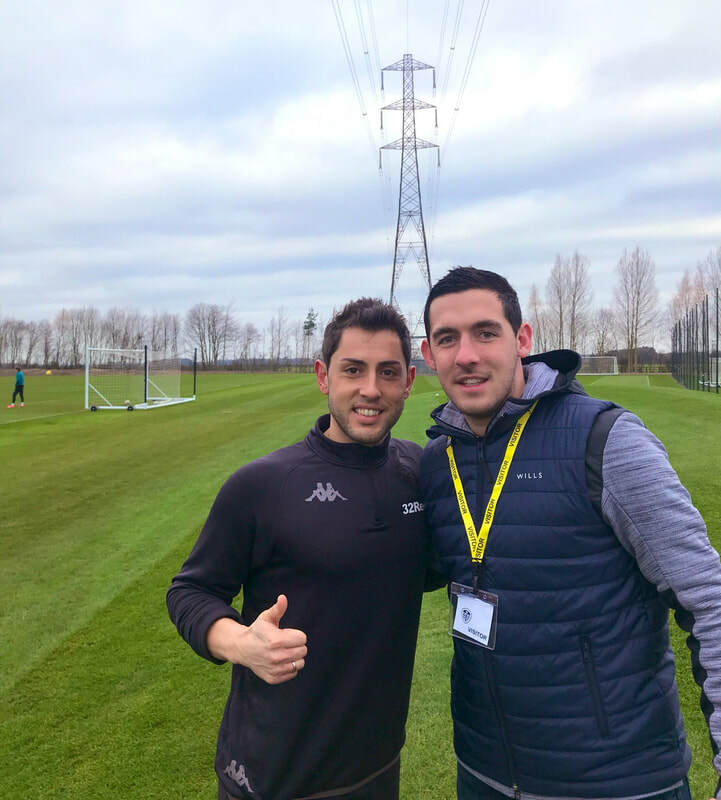 Goalkeeper Coach Marcos Abad had a small area set up behind us to begin work with Bailey-Peacock Farrell and Will Huffer, and his themes for the session focused around tipping high balls, near-post angles from cut-back crosses, and reacting to make double saves inside 10-12 yards. On what seemed to be the main field, there were 6 mannequins set up in the attacking third. Midfielders Lewis Baker, Adam Forshaw, and Tyler Roberts left the core group (who went to warm-up on another empty field) and immediately began working with Assistant Coach Diego Flores on some triangulating movement patterns & combination play. This was fairly intense and included lots of repetition and sharp movement over 15 yard spaces. 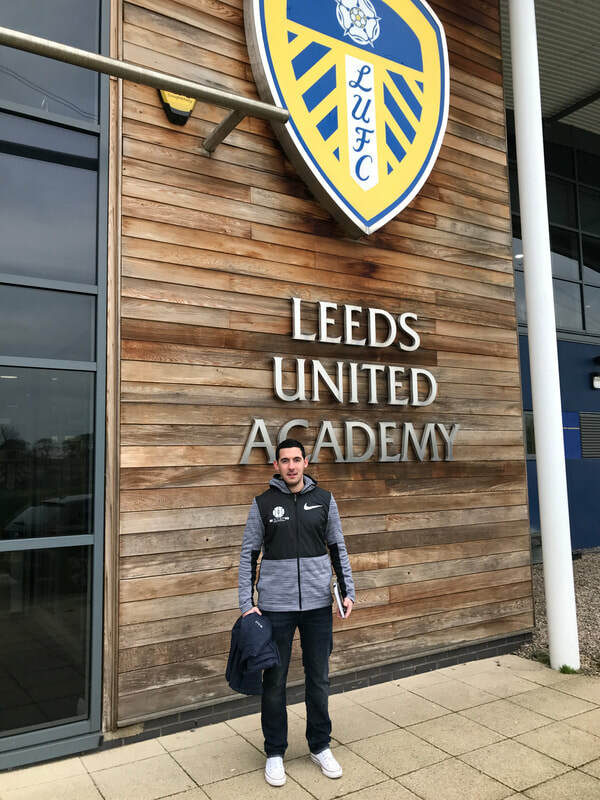 Carlos Corberan (Leeds United’s First team Coach and Head Coach of the u23’s) took 5-6 players over to one field, where he worked them through a very specified passing pattern to replicate playing out of pressure and manipulating the opponents shape to exploit spaces in wide areas. This went on for roughly 15 minutes, and the pattern was obsessively replicated, with extremely fine details touched on by Corberan in terms of angles of reception to the ball, and disguises in body shape when looking to play into the next zone. On another field adjacent, a few other Assistant Coaches worked with a small group of 5 u18 / u23 players. Again, there were mannequins set up in a specific shape, and this group were focusing on building out from the Goalkeeper into the middle third in high intensity bursts. The phase of play itself lasted no more than 10 seconds, but the pattern was repetitive and diligent. Players had cues of exactly when to move into targeted pockets of space either in front of, or behind certain colored mannequins. Everyone knew their part within the pattern, and the detail was intriguing to watch. After the 15 minute warm-up via some passing patterns and agility, the core group of players headed onto the main field to begin the main chunk of the session. By this point, The equipment staff and Assistant Coaching staff had set up an opposition formation (via mannequins) in the attacking half of the field. I had an idea this was going to be some focus on team shape in transitions, and sure enough it was. This was probably my most intriguing part of the day, as the attention to detail was astounding. iPads with numerous members of the coaching staff, filled with specific visual movements for each player to observe and then produce when it was time to execute certain shifts in shape. The shifts in shape were short bursts, yet quick and inventive. I’d like to say I fully understood the tactical transitions completely but I didn’t, as they happened so quick and there were 4 or 5 varied patterns in which each player knew their exact next move. You’d hear a number called out loud by a staff member, and out of nowhere the #2 was suddenly on a full sprint into the #8 position, while the #9 would turn into the #11 and the #11 would become the #10 as the #10 became the #9 (for example). All this happening within about 5 seconds. It is also worth noting how fascinating it was to see the staff to player ratio in the ongoing sessions. As I looked around the numerous fields in use, there must have been a 1-to-3 ratio in every capacity at any moment. The players had plenty of observant eyes on them, but also plenty of willing coaches ready to help and tweak any glitches in preparation that may arise during the session. No stones were left unturned, and it was also quite surprising to me how often the staff would stop exercises and bring the group in to watch more iPad footage or to to get some tactical points across. For many of us, a very contrasting notion in comparison to the new way we are taught to coach in terms of “let the players play”. Nevertheless, as much as I would love to share the actual session diagrams with everyone, and the meticulous approach to pattern play in which Bielsa is renowned for, I unfortunately cannot. But what I can say is this.. For anyone who believes you cannot replicate “game speed” or “realism” when training against mannequins, I challenge you to go and observe a Bielsa team train, and then watch the players replicate the exact motions and movements in real-game situations, consistently. This guy is a genius, and the smallest details matter if you play for him. What angle are your hips facing when you receive the ball? Are you moving when you receive it? - You better be, or you’re going to get hammered by Bielsa personally if you aren’t. Can you drive a pass 22 yards diagonally between two opponents 6 yards apart? Try it, and try again.. He is methodical, consistent, and if there was a Bible for coaching, I would spend my life savings on it.